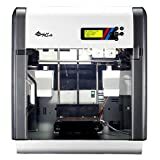 " target="_blank" rel="noopener noreferrer">XYZprinting Da Vinci 2.0 Duo 3D Printer as the filament cartages have an EEPROM in them much like an inkjet printer that prevents the refilling of the cartridge. However this Arduino based micro-controller and a three pin shield allows for the reprograming of the EEPROM and resetting the values making the machine think the refilled cartridge is a new cartridge. As the cover to the left snaps on top and the three pins poke though to mate to the cartridge and the Arduino connect to the computer to run a program with talks to the EEPROM an writes new data. Now for full disclosure, XYZ printing with firmware release makes changes so milage will vary unless you know how micro-controllers work so your millage might vary. As we have more time, we will try and get a more detailed post on this and possiably even a video.